Home Blogs Snap Shots Do you really need a tripod? I could finish this week’s column by answering the “Do you really need a tripod?” by just writing one word – “YES!” However, the editor expects another 699 before he gives the page a tick and ready for printing, so here we go. The reason that everyone needs a tripod is that by having one, this three legged device will open up completely new avenues in photography and let you produce new and different images that are otherwise way beyond your reach. Having said all that, one of the hallmarks of the rankest amateur photographer can also be a tripod. One of those light flimsy devices that are designed to fall over with the first mild breeze. I am all for tripods, but get a decent one (though a mini-tripod for tabletops can be small and lightweight to fit in the bag). Mini-tripod for the camera bag. So what can you do with a tripod that you can’t do without? The most obvious is time exposure shots. The whole secret of time exposure is to keep the camera still, and you can’t do that by holding your breath, leaning against a tree and gripping tightly, let me assure you. Twilight photography and night photography opens up a whole new range of pictures and effects. Just the simple expedient of being able to keep the camera steady while you shoot 30 second or longer exposures will result in some great photographs. Try taking a shot just after sunset, for example. Set the camera on f11 and give it 30 seconds. You will be very pleased with the results. Did you know that the very best landscapes during daylight hours are also best taken on a tripod? To get the huge range of depth of field necessary for these shots, you will end up with slow shutter speeds. The tripod ensures there’s no blurring. Those flowing milky, misty waterfalls are also best taken with a tripod as again a very slow shutter speed is required to capture that effect. Even nature shots are done best with this piece of equipment. You can set up the camera and then leave it, so that the birds etc can get used to its presence, and then with a cable or remote shutter release you can get the nature photos of a lifetime. Another type of shot that needs a tripod is the panorama. A compilation of images which when placed together form a wide angle view of any scene. This can only be done with the use of a tripod. When shooting still life images, a tripod makes these shots a breeze. You can set up the shot and then make minute adjustments while looking through the viewfinder. Again you can use a slow shutter speed to be able to use very small apertures (around f22) to get the very fine detail into the shot. What should you look for and what should you spend? There are several items in the specifications on any tripod you buy. The first is that it is heavy with strong legs when extended fully. The “locks” on the legs must also be secure. Another item is that the actual swivel head incorporates a spirit level, so that you can ensure the top swivels in a true horizontal arc. The tripod head should also have calibrations, so you can swing it a definite number of degrees. 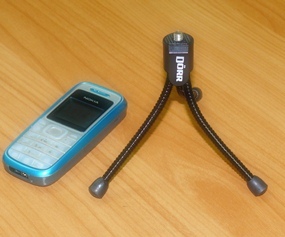 A removable “shoe” is also a good item, as you can then position the camera on the tripod, but also remove the camera to take other shots but then replace it in exactly the same position. The legs should be able to be spread out widely so that you can get the camera very close to the ground, and finally if you can get one, see if the tripod shaft can be removed and turned upside down, as this can get your camera completely at ground level and immediately above an object placed on the ground. How much will this cost? Expect to spend a minimum of 6000 baht. My own Manfrotto cost a lot more than that, let me assure you, but with now 20 years of faithful service, it has been a bargain!